A streetfood is always tempting everyone’s taste buds and makes you drool when you view it at roadside chaat stalls. Aloo Kabli or spicy aloo chaat is a very popular street food of Kolkata, might remind you of your school days. It is a part of traditional bengali street food that is served on these leaves of the Shaal tree, called”Shaal Pata" in Bengali. These leaves are usually formed into coned and secured with a toothpick, and food such as alu-kabuli (Potato and chickpeas), phuchka etc are served on this. The sweet & sour chutney and the green chilies mix to create an delighted smell of freshness, which I have never got from any dish. 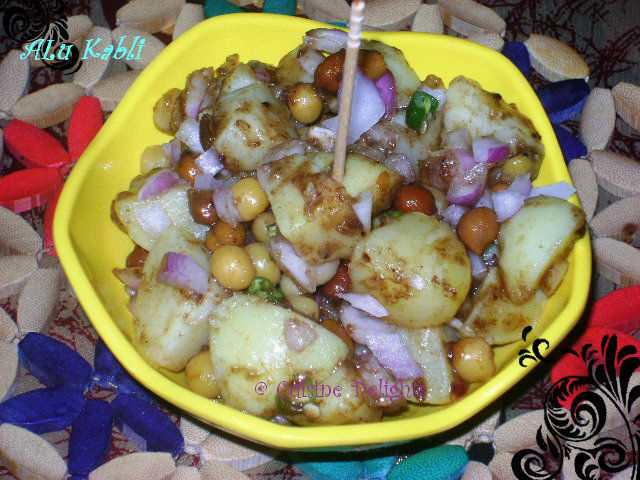 The spices make a brilliant hot and sour combination, and of course the potatoes muttar and chana add to the joy of having it. It gives me magical and refreshing and stir up all the marvelous cravings for the tasty, tangy flavors of street food. Soak the black chana, yellow muttar overnight. Boil it adding a teaspoon of salt. Drain off water and keep aside. Boil the potatoes without taking out its peel (potato should not be over boiled). Now peel it out and cut into small cubes. Chop the onions very finely, the chilies in small rings. 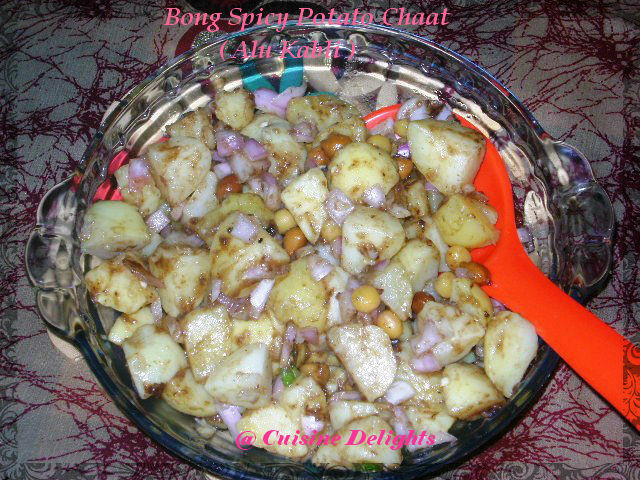 Take a bowl add cubed potato, red chili powder, roasted cumin powder along with the onions, green chili and salt mix well. Spread boiled chana, peas, green chutney, sweet & sour chutney. Toss it so that it gets evenly mixed with the potatoes.